“There have been many American SIGN painters, but there never were any American sign PAINTERS.” This exercise in emphasis sums up Robert Indiana’s position in the world of contemporary art. He has taken the everyday symbols of roadside America and made them into brilliantly colored geometric pop art. In his work he has been an ironic commentator on the American scene. 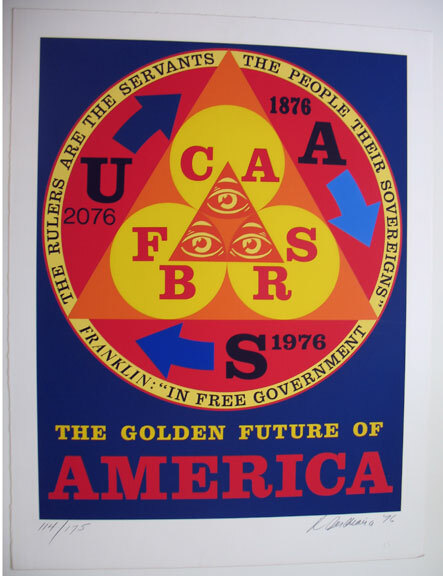 Both his graphics and his paintings have made cultural statements on life and, during the rebellious 1960s, pointed political statements as well. Born Robert Clark in New Castle, Indiana, in 1928, he adopted the name of his native state as a pseudonymous surname early in his career. During his typically Midwestern boyhood, highway signs had a symbolic importance for him. His father worked for Phillips 66 gas and, when he left his wife and son, he did so down Route #66. And the diner which his mother subsequently operated had the familiar “EAT” sign looming overhead. 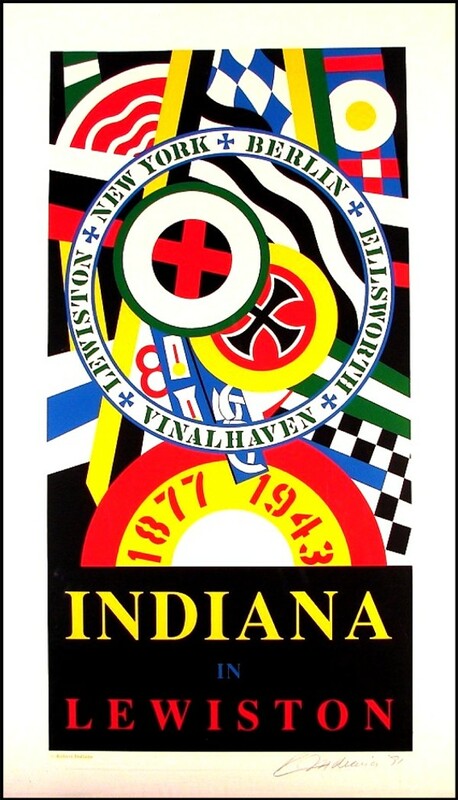 Indiana studied first at the Herron School of Art in Indianapolis and then at the Munson-Williams-Proctor Institute in Utica, New York. From there he went to the School of the Art Institute of Chicago where he received a degree in 1953 and won a traveling fellowship to Europe. In 1954, he attended Edinburgh University and Edinburgh College of Art in Scotland. Back in America, Indiana settled in the historic Coentes Slip area on the New York waterfront in 1956 and showed his first hard-edged paintings the following year. From the start he worked with bold, contrasting, sometimes clashing, colors that mirror familiar signs along the highways. The American dream has been a recurring theme in Indiana’s work, and he has used it to both celebrate and criticize the national way of life. In the midst of all the gaudy, star-spangled color of The American Dream #J (1961, Museum of Modern Art), for instance, he highlights the words “Take All” and “Tilt” as reminders both of Americans’ materialism and of the tendency of some to cheat, as they do on pinball machines. In his paintings and constructions he has given new meaning to such basic words as “Eat”, “Die” and “Love” . Using them in bold block letters in vivid colors, he has enticed his viewers to look at the commonplace from a new perspective. One indication of his success was the appearance of his immensely popular multi-colored “Love” on a United States postage stamp in 1973.